In this work, we study the flow and heat transfer characteristics of a viscous nanofluid over a nonlinearly stretching sheet in the presence of thermal radiation, included in the energy equation, and variable wall temperature. A similarity transformation was used to transform the governing partial differential equations to a system of nonlinear ordinary differential equations. An efficient numerical shooting technique with a fourth-order Runge-Kutta scheme was used to obtain the solution of the boundary value problem. 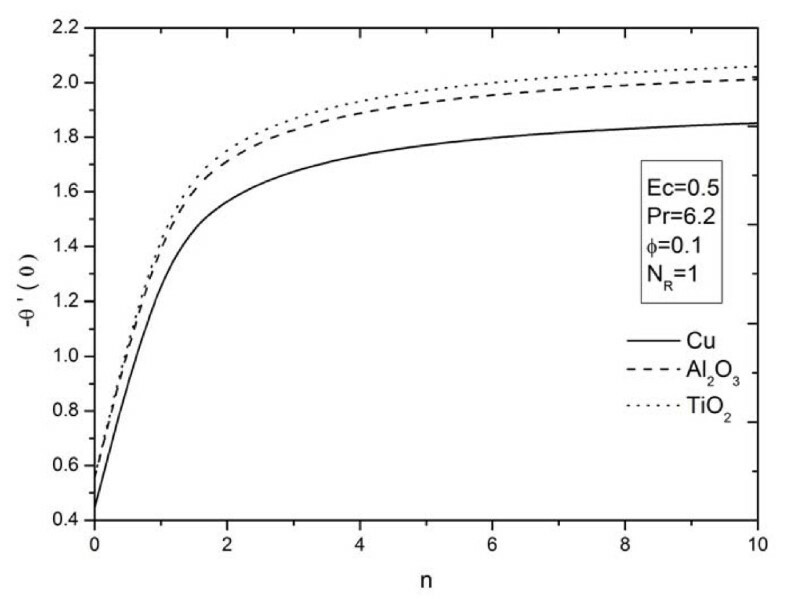 The variations of dimensionless surface temperature, as well as flow and heat-transfer characteristics with the governing dimensionless parameters of the problem, which include the nanoparticle volume fraction ϕ, the nonlinearly stretching sheet parameter n, the thermal radiation parameter N R , and the viscous dissipation parameter Ec, were graphed and tabulated. Excellent validation of the present numerical results has been achieved with the earlier nonlinearly stretching sheet problem of Cortell for local Nusselt number without taking the effect of nanoparticles. The problem of viscous flow and heat transfer over a stretching sheet has important industrial applications, for example, in metallurgical processes, such as drawing of continuous filaments through quiescent fluids, annealing and tinning of copper wires, glass blowing, manufacturing of plastic and rubber sheets, crystal growing, and continuous cooling and fiber spinning, in addition to wide-ranging applications in many engineering processes, such as polymer extrusion, wire drawing, continuous casting, manufacturing of foods and paper, glass fiber production, stretching of plastic films, and many others. During the manufacture of these sheets, the melt issues from a slit and is subsequently stretched to achieve the desired thickness. The final product with the desired characteristics strictly depends upon the stretching rate, the rate of cooling in the process, and the process of stretching. In view of these applications, Sakiadis [1, 2] investigated the boundary-layer flow of a viscous fluid past a moving solid surface; various aspects of the problem have been explored by many authors in the past decades. However, all these studies are restricted to linear stretching of the sheet. It is worth mentioning that the stretching is not necessarily linear. In view of this, Kumaran and Ramanaih  studied flow over a quadratic stretching sheet, but only a few recent studies focused on exponentially and nonlinearly stretching sheet are cited here. Magyari and Keller , Elbashbeshy , Khan and Sanjayanand , Sanjayanand and Khan , Sajid and Hayat , and Partha et al. studied the heat transfer characteristics of viscous and viscoelastic fluid flows over an exponentially stretching sheet. Vajravelu , Vajravelu and Cannon , Cortell [12–15], Prasad et al. , Afzal , and Nandeppanavar et al. studied the effects of various parameters governing the flow of a viscous fluid over a nonlinearly stretching sheet. A nanofluid is a new class of heat transfer fluids that contain a base fluid and nanoparticles. The use of additives is a technique applied to enhance the heat transfer performance of base fluids. The thermal conductivity of ordinary heat transfer fluids is not adequate to meet today's cooling rate requirements. Nanofluids have been shown to increase the thermal conductivity and convective heat transfer performance of the base liquids. Nanofluids are suspensions of submicronic solid particles (nanoparticles) in common fluids. The term was coined by Choi . The characteristic feature of nanofluids is thermal conductivity enhancement, a phenomenon observed by Masuda et al. . This phenomenon suggests the possibility of using nanofluids in advanced nuclear systems . A comprehensive survey of convective transport in nanofluids was made by Buongiorno , who says that a satisfactory explanation for the abnormal increase of the thermal conductivity and viscosity is yet to be found. He focused on further heat transfer enhancement observed in convective situations. Very recently, Kuznetsov and Nield  have examined the influence of nanoparticles on natural convection boundary-layer flow past a vertical plate using a model in which Brownian motion and thermophoresis are accounted for. The authors have assumed the simplest possible boundary conditions, namely those in which both the temperature and the nanoparticle fraction are constant along the wall. Furthermore, Nield and Kuznetsov [24, 25] have studied the Cheng and Minkowycz  problem of natural convection past a vertical plate in a porous medium saturated by a nanofluid. The model used for the nanofluid incorporates the effects of Brownian motion and thermophoresis for the porous medium. The Darcy model has been employed. Hamad and Bashir  numerically investigated the problem of forced convection heat transfer to the power law non-Newtonian nanofluid from the stretching surface. Khan and Pop  focused on the problem of laminar fluid flow, which results from the stretching of a flat surface in a nanofluid. A similarity solution of the steady boundary layer flow near the stagnation-point flow on a permeable stretching sheet in a porous medium saturated with a nanofluid and in the presence of internal heat generation/absorption was theoretically studied by Hamad and Pop . Hamad and Ferdows  investigated the heat and mass transfer analysis for boundary layer stagnation-point flow over a stretching sheet in a porous medium saturated by a nanofluid with internal heat generation/absorption and suction/blowing. 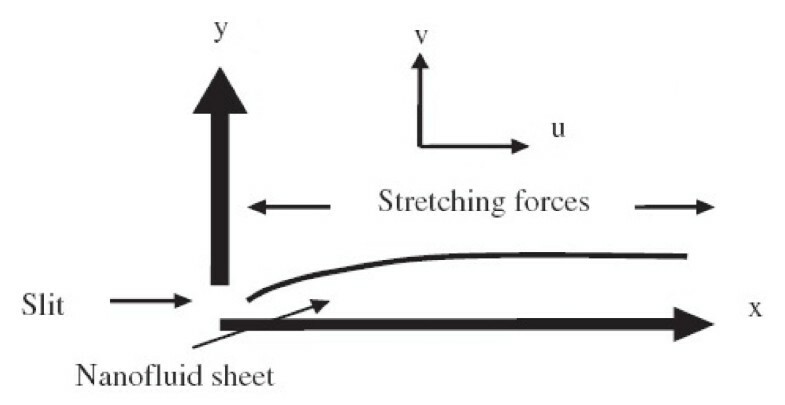 The problem of laminar fluid flow, which results from the stretching of a vertical surface with variable stream conditions in a nanofluid, was investigated numerically by Kandasamy et al. . Makinde and Aziz  studied numerically the boundary layer flow induced in a nanofluid due to a linearly stretching sheet. Hamad  examined the convective flow and heat transfer of an incompressible viscous nanofluid past a semi-infinite vertical stretching sheet in the presence of a magnetic field. All these researchers studied the linear stretching sheet in the nanofluid, but only the numerical investigation by Rana and Bhargava  studied the steady laminar boundary fluid flow, which results from the non-linear stretching of a flat surface in a nanofluid, and incorporated the effects of Brownian motion and thermophoresis. Also, more recently, Nadeem and Lee  investigated analytically the problem of steady boundary layer flow of nanofluid over an exponential stretching surface including the effects of Brownian motion parameter and thermophoresis parameter. To the authors' knowledge, no studies have thus far been communicated with regard to the boundary layer viscous flow and heat transfer of a nanofluid past a nonlinearly stretching sheet in the presence of the radiation effect in a one-phase model. The aim of the present paper is therefore to extend the work of Cortell  by taking the steady thermal boundary-layer flow with nonlinearly stretching sheet in a nanofluid. The present study is of immediate interest to all those processes which are highly affected with heat enhancement concept, e.g., cooling of metallic sheets or electronic chips, etc. An efficient numerical shooting technique with a fourth-order Runge-Kutta scheme was used to solve the normalized boundary layer equations, and the effects of nanoparticle volume fraction ϕ, nonlinearly stretching sheet parameter n, thermal radiation parameter N R , and viscous dissipation parameter Ec are described in details and are further presented in tabular form. A schematic diagram of the physical model. Thermo-physical properties of fluid and nanoparticles (Oztop and Abu-Nada ). u ∂ T ∂ x + v ∂ T ∂ y = α n f ∂ 2 T ∂ y 2 + υ n f ( c p ) n f ∂ u ∂ y 2 - 1 ( ρ c p ) n f ∂ q r ∂ y .
υ n f = μ n f ρ n f , ρ n f = ( 1 - ϕ ) ρ f + ϕ ρ s , μ n f = μ f ( 1 - ϕ ) 2 . 5 , α n f = k n f ( ρ c p ) n f , ( ρ c p ) n f = ( 1 - ϕ ) ( ρ c p ) f + ϕ ( ρ c p ) s , k n f k f = ( k s + 2 k f ) - 2 ϕ ( k f - k s ) ( k s + 2 k f ) + 2 ϕ ( k f - k s ) . T 4 ≅ 4 T ∞ 3 T - 3 T ∞ 4 .
where k 0 = 3 N R 3 N R + 4 . It is worth citing here that the classical solution for energy equation, Equation 8, without thermal radiation influence can be obtained from the above equation, which reduces to u ∂ T ∂ x + v ∂ T ∂ y = α n f ∂ 2 T ∂ y 2 as N R →∞ (i.e., k0 → 1) and eliminates viscous dissipation. where Pr = υ f /α f is the Prandtl number, and Ec = u w 2/[(c p ) f (Tw - T∞)] is the Eckert number. In the above equations, primes denote differentiation with respect to η. C f = 2 μ n f ρ f ( u w ( x ) ) 2 ∂ u ∂ y y = 0 ; N u x = - k n f ∂ T ∂ y y = 0 x k f ( T w - T ∞ ) . 2 υ f C N u x = - k n f n + 1 k f x n + 1 2 θ ′ ( 0 ) . In order to get the physical insight into the flow problem, comprehensive numerical computations are conducted for various values of the parameters that describe the flow characteristics, and the results are illustrated graphically. The system of nonlinear ordinary differential Equations 10 and 12 with the boundary conditions (Equation 13) are integrated numerically by means of the efficient numerical shooting technique with a fourth-order Runge-Kutta scheme (MATLAB package). The step size η = 0.001 was used while obtaining the numerical solution with ηmax = 6. The physical quantities of interest here are the skin friction coefficient C f and the Nusselt number Nu x , which are obtained and given in Equations 15 and 16. The distributions of the velocity f'(η), the temperature θ(η) from Equations 10 and 12, the skin friction at the surface, and the Nusselt number for different types of nanofluids are shown in Figures 2,3,4,5,6,7,8,9,10,11,12,13,14. 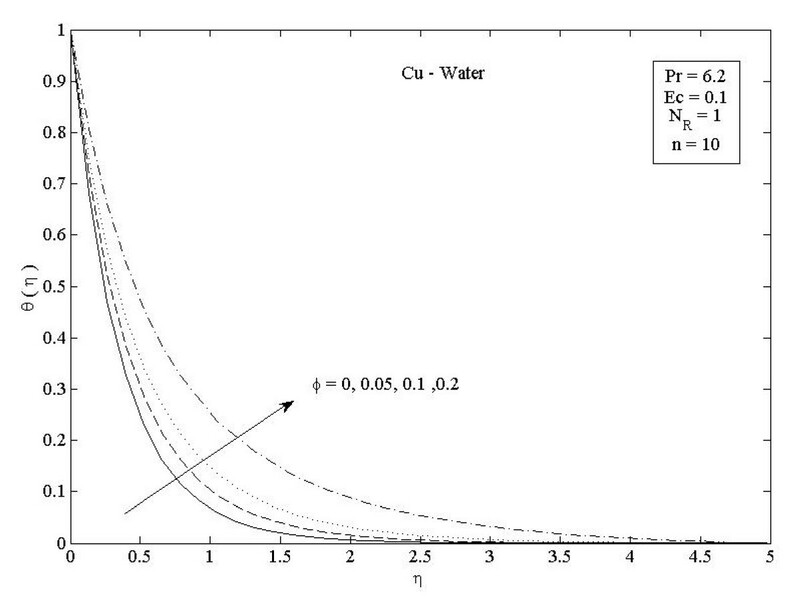 Effects of nanoparticle volume fraction ϕ on velocity distribution f '( η ) in the case of Cu-water. Effects of nanoparticle volume fraction ϕ on temperature profiles θ ( η ) in the case of Cu-water. 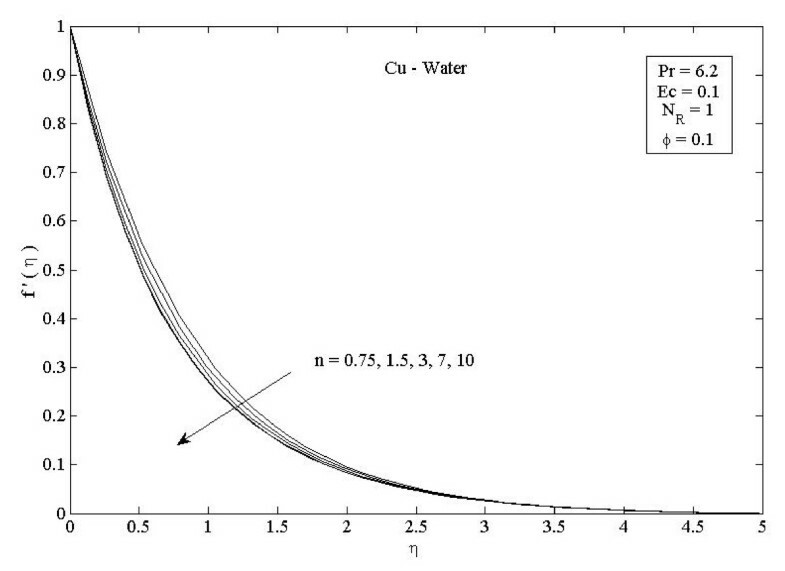 Parameter n on velocity distribution f '( η ) in the case of Cu-water. Effects of nonlinearly stretching sheet parameter n on velocity distribution f'(η) in the case of Cu-water. Parameter n on temperature profiles θ ( η ) in the case of Cu-water. 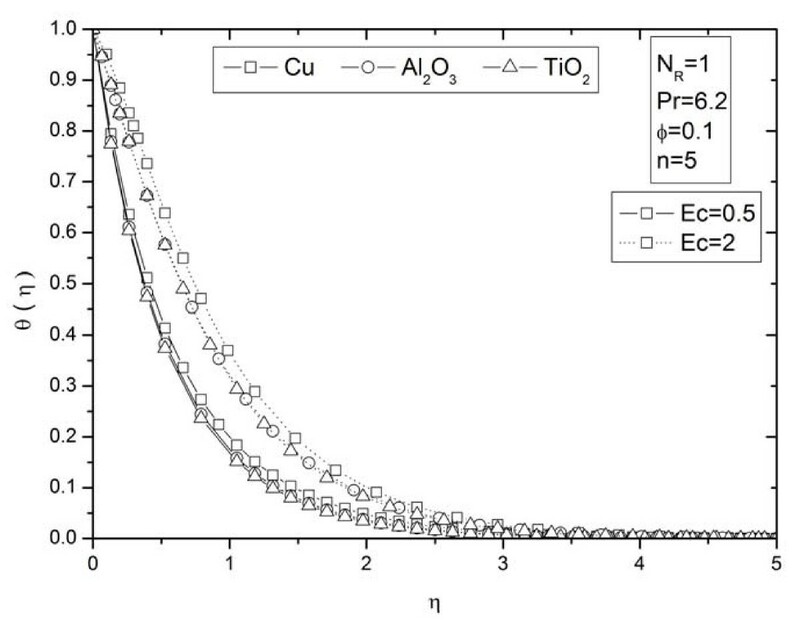 Effects of nonlinearly stretching sheet parameter n on temperature profiles θ(η) in the case of Cu-water. 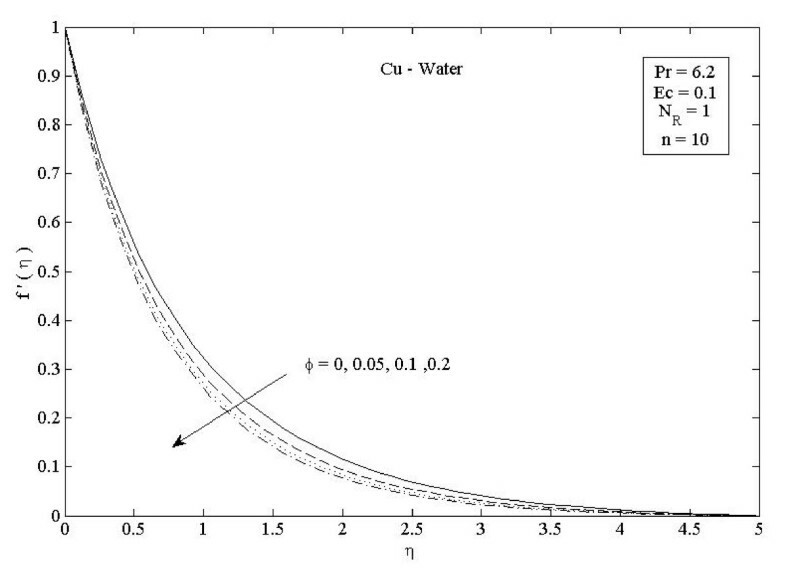 Effects of viscous dissipation parameter Ec on temperature profiles θ ( η ) in the case of Cu-water. 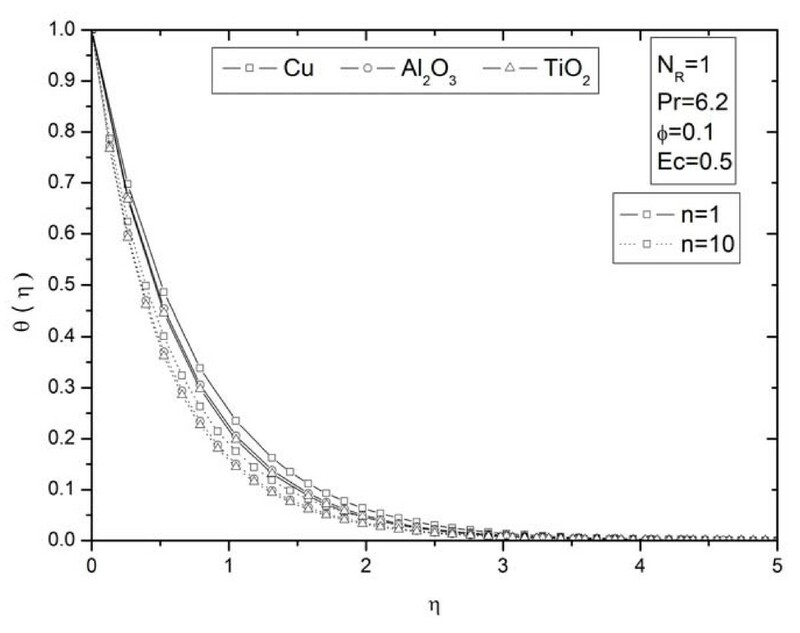 Effects of thermal radiation parameter N R on temperature profiles θ ( η ) in the case of Cu-water. Effects of thermal radiation parameter N R on temperature profiles θ ( η ) for different types of nanoparticles. Effects of viscous dissipation parameter Ec on temperature profiles θ ( η )for different types of nanoparticles. Parameter n on temperature profiles θ ( η )for different types of nanoparticles. Effects of nonlinearly stretching sheet parameter n on temperature profiles θ (η) for different types of nanoparticles. Parameter n on skin friction coefficient for different types of nanoparticles. Effects of nonlinearly stretching sheet parameter n on skin friction coefficient for different types of nanoparticles. Effects of thermal radiation parameter N R on heat transfer rate for different types of nanoparticles. Effects of viscous dissipation parameter Ec on heat transfer rate for different types of nanoparticles. Parameter n on heat transfer rate for different types of nanoparticles. Effects of nonlinearly stretching sheet parameter n on heat transfer rate for different types of nanoparticles. We consider three different types of nanoparticles, namely, copper (Cu), alumina (Al2O3), and titanium oxide (TiO2), with water as the base fluid. Table 1 shows the thermo-physical properties of water and the elements Cu, Al2O3, and TiO2. The Prandtl number of the base fluid (water) is kept constant at 6.2. It is worth mentioning that this study reduces the governing Equations 10-12 to those of a viscous or regular fluid when ϕ = 0. In order to verify the accuracy of the present method, we have compared our results with those of Cortell [12, 13] for the rate of heat transfer - θ'(0) in the absence of the nanoparticles (ϕ = 0), without (N R → ∞ (i.e., k0 = 1)) and with thermal radiation parameter. The comparisons in all the above cases are found to be in excellent agreement, as shown in Tables 2 and 3. Table 4 depicts the skin friction at the surface - f"(0) for various values of nonlinear stretching sheet n, with ϕ = 0.1, Pr = 6.2, Ec = 0.5, and N R = 5 for different types of nanoparticles when the base fluid is water. 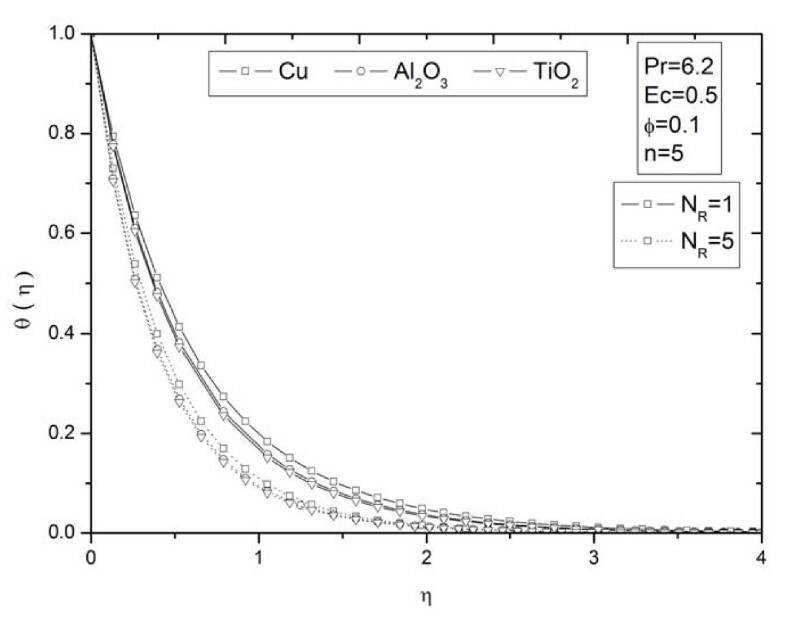 It can be seen from Table 4 that |f"(0)| increases with an increase in the nonlinear stretching parameter n, and the Cu nanoparticles are the highest skin friction, followed by TiO2 and Al2O3. Comparison of - θ' (0) with ϕ = 0 and N R → ∞ (i.e., k0 = 1). Comparison of - θ'(0) for various values of thermal radiation parameter N R with ϕ = 0 (regular fluid). Values related to the skin friction for different values of n.
With ϕ = 0.1, Pr = 6.2, Ec = 0.5, and N R = 35. 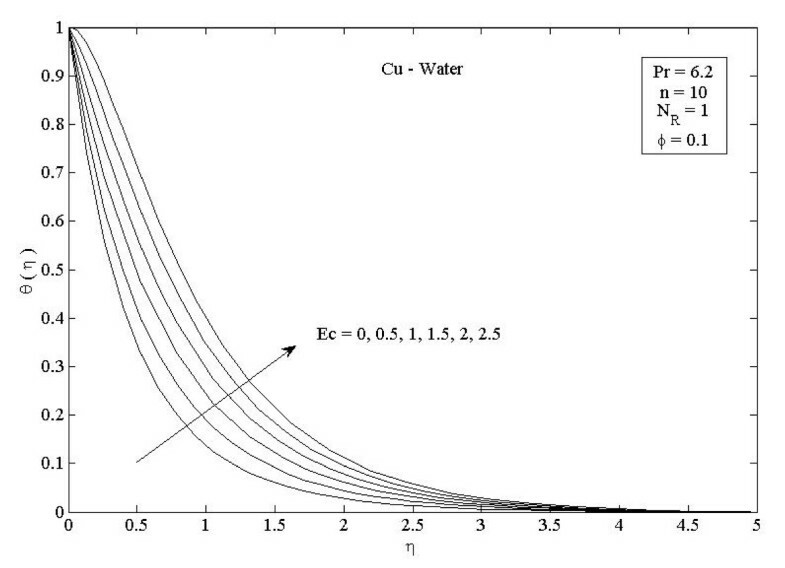 Figures 2 and 3 illustrate the effect of nanoparticle volume fraction ϕ on the nanofluid velocity and temperature profile, respectively, in the case of Cu nanoparticles and water base fluid (Pr = 6.2) when ϕ = 0, 0.05, 0.1, and 0.2, with Ec = 0.1, n = 10, and NR = 1. It is clear that, as the nanoparticles volume fraction increases, the nanofluid velocity decreases, and the temperature increases. These figures illustrate this agreement with the physical behavior. When the volume of nanoparticles increases, the thermal conductivity increases, and then the thermal boundary layer thickness increases. Figures 4 and 5 depict the effect of nonlinearly stretching sheet parameter n on velocity distribution f'(η) and temperature profile θ(η), respectively. 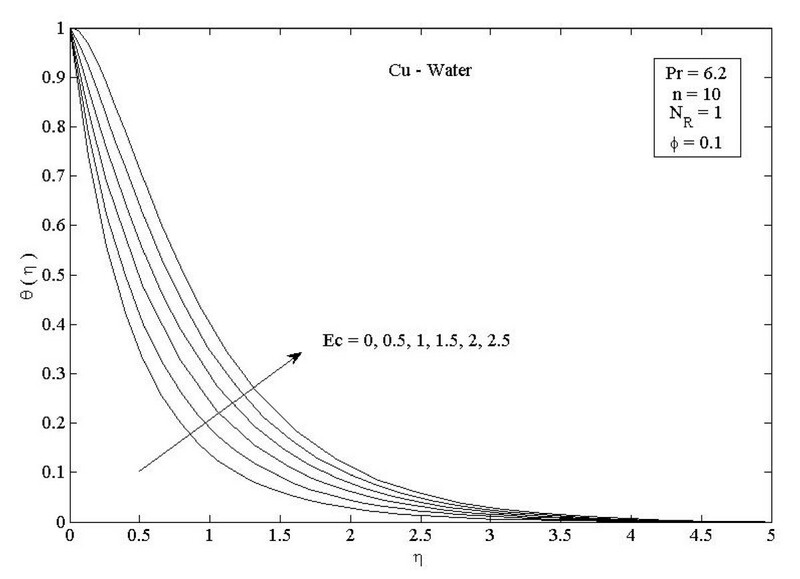 Figure 4 illustrates that an increase of nonlinear stretching sheet parameter n tends to decrease the nanofluid velocity in the case of Cu-water when n = 0.75, 1.5, 3, 7, and 10, with Ec = 0.1, N R = 1, and ϕ = 0.1. Furthermore, Figure 5 shows that increasing the nonlinear stretching sheet parameter n tends to decrease the temperature distribution the same values, thus leading to higher heat transfer rate between the nanofluid and the surface. 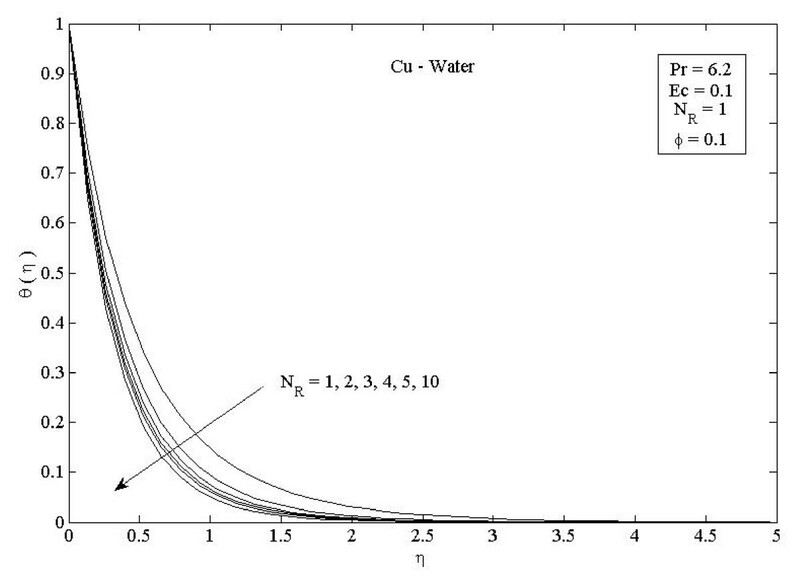 The effect of the viscous dissipation parameter Ec on the temperature profile in the case of Cu-water when the Eckert number Ec = 0, 0.5, 1, 1.5, 2, and 2.5 with n = 10, N R = 1, and ϕ = 0.1 is shown in Figure 6. It is clear that the temperature distribution increases with an increase in the viscous dissipation parameter Ec. Figure 7 shows the influence of thermal radiation parameter N R on the temperature profile in the case of Cu-water. It is clear that the temperature decreases with an increase in the thermal radiation parameter N R ; this leads to an increase in the heat transfer rate. 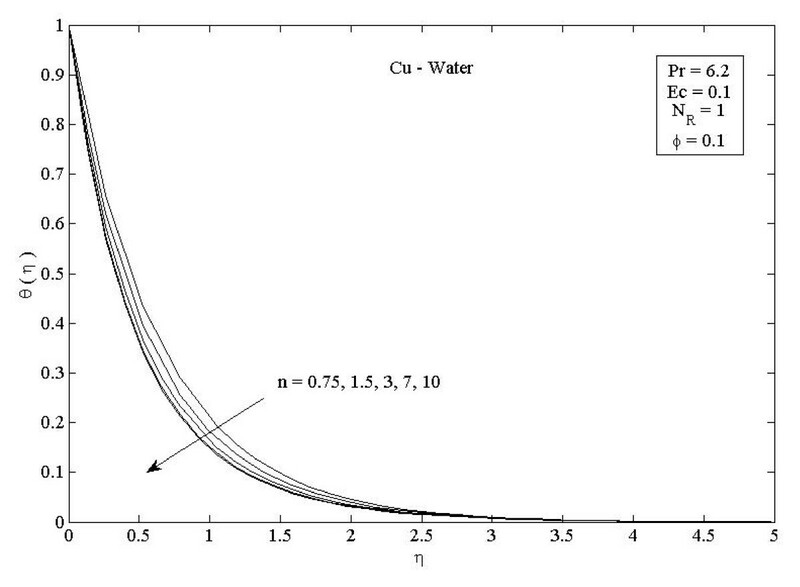 Moreover, Figure 8 shows this effect of the thermal radiation parameter on the temperature distribution but for the different types of nanoparticles with water as the base fluid. 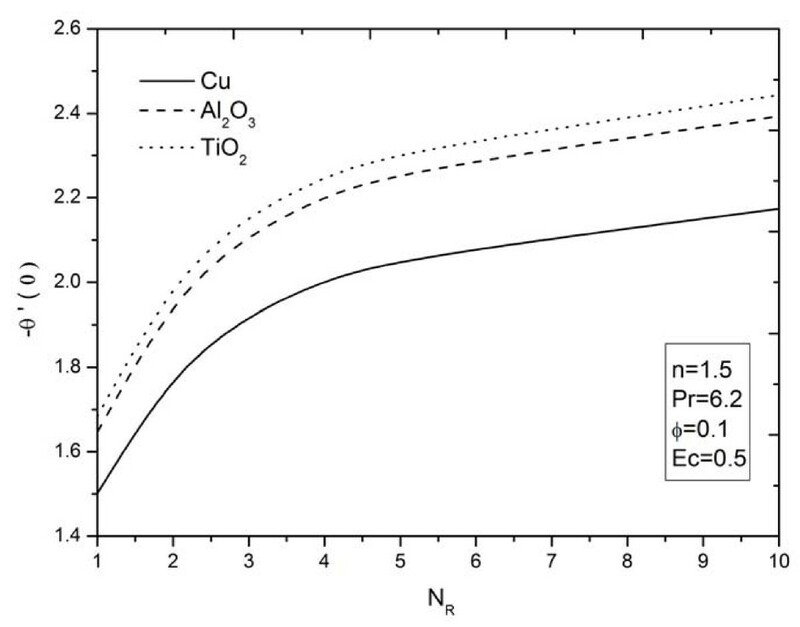 It can be seen from Figure 8 that θ(η) decreases with an increase in the thermal radiation parameter as shown in Figure 7, and the Cu nanoparticles have the highest value of temperature distribution than the nanoparticles Al2O3 and TiO2. 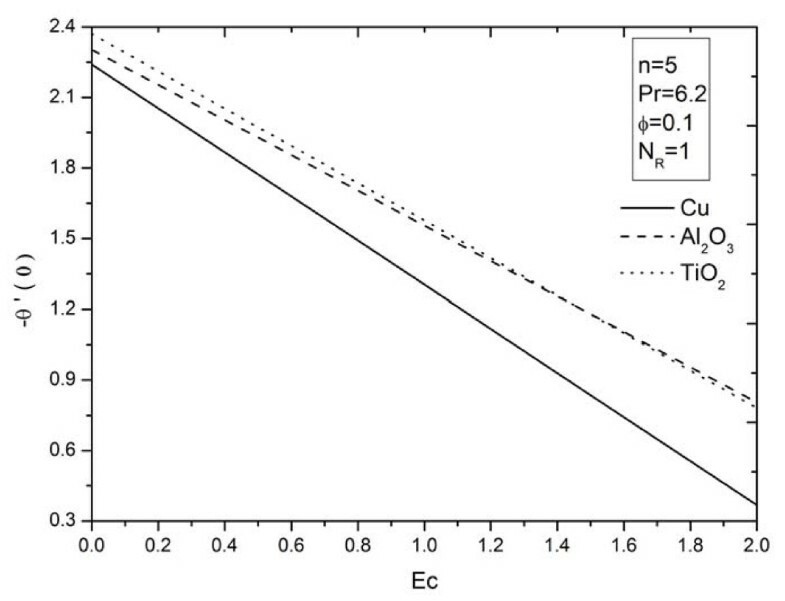 The influence of Ec and n on the temperature profiles for all types of nanoparticles is shown in Figures 9 and 10, respectively. 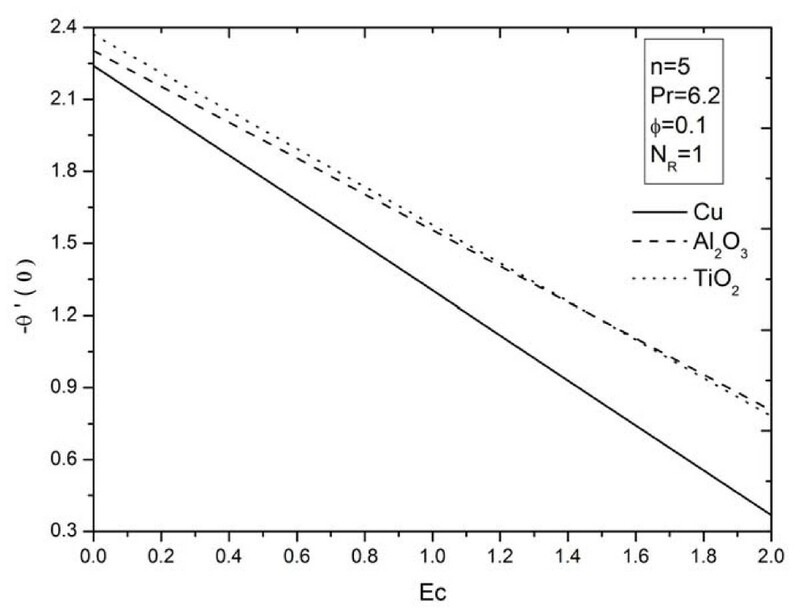 It is found that the temperature decreases with n and increases with Ec as shown in Figures 5 and 6, respectively, and the TiO2 nanoparticles proved to have the highest cooling performance for this problem. 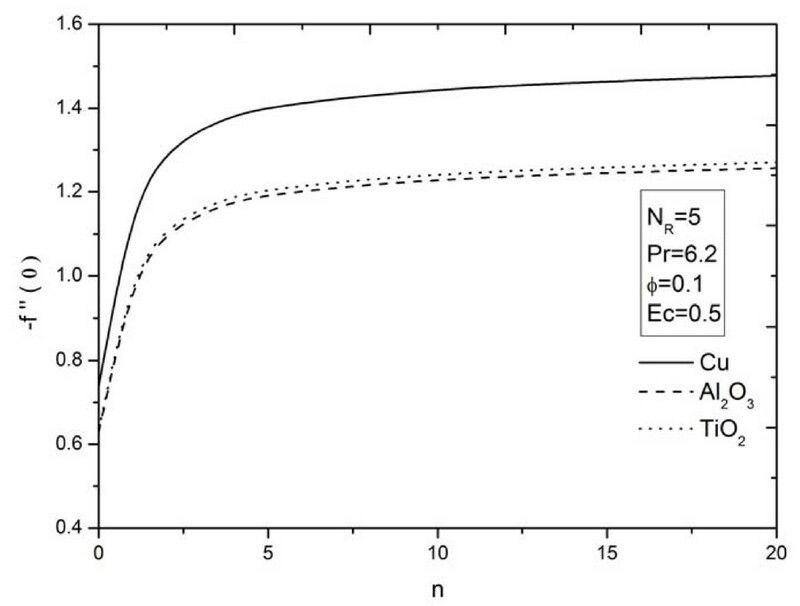 The influence of nonlinear stretching sheet n on the skin friction at the surface -f'' (0) with N R = 5, Pr = 6.2, ϕ = 0.1, and Ec = 0.5 is shown in Figure 11. It can be noticed that, from Table 4 and Figure 11, the numerical values of |f'' (0)| for different kinds of nanofluids increase with an increase in the nonlinear stretching parameter n. This implies an increment of the skin friction at the surface where Cu nanoparticles have the highest skin friction than the other nanoparticles. 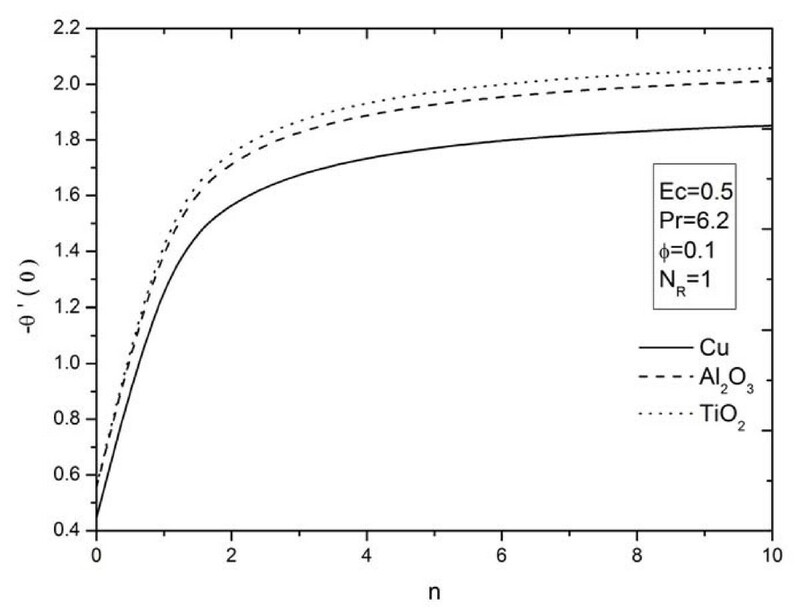 Figures 12,13,14 display the behavior of the heat transfer rates under the effects of N R , Ec, and n, respectively, using different nanofluids for Pr = 6.2 and ϕ = 0.1. These figures show that, when using different kinds of nanofluids, the heat transfer rates change, which means that the nanofluids will be important in the cooling and heating processes. It can be noticed from the results above that, as expected, the heat transfer rate increases with an increase in the thermal radiation parameter N R and nonlinear stretching sheet parameter n, and decreases rapidly with an increase in the viscous dissipation parameter Ec. The problem of boundary-layer flow and heat transfer in a viscous nanofluid over a nonlinearly stretched non-isothermal moving flat surface in the presence or absence of thermal radiation using the Rosseland approximation for the radiative heat flux was analyzed. The governing partial differential equations were converted to ordinary differential equations by using a suitable similarity transformation and were then solved numerically via shooting method by employing throughout our calculations the fourth-order Runge-Kutta scheme (MATLAB package). The effects of the solid volume fraction ϕ, thermal radiation parameter N R , nonlinear stretching sheet parameter n, and the viscous dissipation parameter Ec on the flow and heat transfer characteristics are determined for three kinds of nanofluids: copper, alumina, and titanium oxide. The increase of the solid volume fraction ϕ and the nonlinear stretching sheet parameter n leads to the decrease of dimensionless surface velocity; this yields an increase in the skin friction at the surface. An increment in the solid volume fraction ϕ and the Eckert number Ec yields an increment in the nanofluid's temperature; this leads to a rapid reduction in the heat transfer rates. An increase in the thermal radiation parameter N R and the nonlinear stretching sheet parameter n yields a decrease in the nanofluid's temperature, which leads to an increase in the heat transfer rates. The TiO2 nanoparticles proved to have the highest cooling performance for this problem than the other two types of nanoparticles (cu and Al2O3 nanoparticles). b: constant; C: physical parameter related with stretched surface; C f : skin friction coefficient; c p : specific heat; Ec: Eckert number; f: dimensionless stream function; k: thermal conductivity; k*: mean absorption coefficient; m: surface temperature parameter; N R : radiation parameter; Nu x : Nusselt number; Pr: Prandtl number; q r : radiative heat flux; n: nonlinear stretching parameter; T: temperature; u and v: velocity components along x- and y-directions: respectively; x and y: Cartesian coordinates along the plate and normal to it: respectively. α: thermal diffusivity; η: similarity variable; θ: dimensionless temperature; μ: effective viscosity; υ: kinematic viscosity; ρ: density; σ*: Stefan-Boltzmann constant; (ρC p ) nf, heat capacitance of the nanofluid; (ρC p )f: heat capacity of the fluid; (ρC p ) s : effective heat capacity of the nanoparticle material; ϕ: nanoparticle volume fraction. f: fluid fraction; nf: nanofluid fraction; s: solid fraction; w: condition at the wall; ∞: stream function condition at infinity. FMH and FSI are professors of applied mathematics. SMAG is a mathematics lecturer, and MR is a PhD student. This is just a theoretical study; every experimentalist can check it experimentally with our consent. The authors are very thankful to the editor and the reviewers for their constructive comments and suggestions to improve the presentation of this paper. MRE did the major part of the article; however, the funding, computational suggestions, and proof reading were done by FSI, FMH and SMAG. All authors read and approved the final manuscript.